An interconnection customer (IC) who wants to connect a generating facility to the California ISO grid must apply and meet the requirements set out by the California Independent System Operator (CAISO). The facility may use the traditional Queue Cluster Study Process or the Fast Track Process to qualify for interconnection. Each process has eligibility requirements that the facility must meet in order to apply using that process. The specific requirements and a detailed explanation of each study process are available in the Generation Interconnection and Deliverability Allocation Procedures. All generating facilities seeking interconnection with the Distribution Providers Transmission System must apply with CAISO for interconnection and are subject to the CAISO tariff. Those generating facilities, subject to Federal Energy Regulatory Commission (FERC) jurisdiction must apply under a Distribution Provider’s Wholesale Distribution Tariff (WDT) regardless of whether they interconnect to a Distribution Provider’s Distribution or Transmission System. Cal. Pub. Util. Code, Rule 21 Generating Facility Interconnections; CPUC Decision 12-09-018, at p. A-1-A-2 (In 2012, the California Public Utility Commission adopted a settlement agreement revising electric tariff Rule 21, this settlement agreement added language to state clearly when an applicant may apply for interconnection pursuant to Rule 21 procedures). 8-CA-b.1 – Is the Project Eligible for the Fast Track Process? In order to be eligible for the Fast Track Process, the project must be a certified small generating facility that does not have a generating capacity of more than 5 MW and is applying for energy-only deliverability status. Energy only deliverability status is defined as a condition elected by an IC for a large generating facility interconnected with the CAISO controlled grid that makes the IC responsible only for the costs of reliability network upgrades and not the cost of delivery network upgrades. The IC must submit a completed interconnection request (IR), a $500 processing fee, a study deposit of $1,000, and a demonstration of site exclusivity. The IC may request to be evaluated under the Fast Track Process at any time. If the proposed project is Fast Track Eligible, the facility must pass the required screening process to be approved for interconnection to the grid. Generation Interconnection and Deliverability Allocation Procedures, section 5. For interconnection of a proposed facility to a radial transmission circuit, the aggregated generation on the circuit, including the proposed generating facility, does not exceed 15 percent of the line section annual peak load as most recently measured at the substation. A line section is the portion of a participating transmission owner's (TO) electric system connected to a customer bounded by automatic sectionalizing devices or the end of the transmission line. For interconnection of a proposed Generating Facility to the load side of spot network protectors, the proposed Generating Facility must utilize an inverter-based equipment package and, together with the aggregated other inverter-based generation, not exceed the smaller of 5 percent of a spot network's maximum load or 50 kW. A spot network is a type of distribution system found in modern commercial buildings for the purpose of providing high reliability of service to a single retail customer. The proposed generating facility, together with other generation on the transmission circuit, must not cause any transmission protective devices and equipment (including, but not limited to, substation breakers, fuse cutouts, and line reclosers), or IC equipment on the system to exceed 87.5 percent of the short circuit interrupting capability; nor shall the interconnection proposed for a circuit that already exceeds 87.5 percent of the short circuit interrupting capability. If the proposed project passes all of the screens then the IR will be approved. If the proposed project fails one or more of the screens, but the CAISO and participating TO determine that the generating facility can still be interconnected consistent with safety, reliability, and power quality standards, then the IR will also be approved. If however, the proposed project fails one or more of the screens and it is determined that the project cannot be interconnected according the safety, reliability, and power quality standards, the project must continue to the Cluster Queue Process. A developer may submit an IR for the Queue Cluster Process during one annual window, April 1st through the 31st. All IRs received during this window will be studied in the same cluster. A "Cluster" is the process of studying a group of generator IRs together, instead of individually, for the purpose of conducting interconnection system impact studies. Many circumstances outside the Independent Service Operator's (ISO) control require consideration before connecting to the grid, e.g., environmental requirements, land acquisition, equipment availability and permits, so the answer is not steadfast. However, an IC’s commercial operation date (COD) cannot exceed seven years from the date on the IR, unless mutually agreed by the TO, IC, & ISO to delay beyond the seven years. Generation Interconnection and Deliverability Allocation Procedures, section 3.3. The Interconnection Study Deposit is the first of the three items that the IC must include in its package in order to have a complete IR. With the exceptions of the Fast Track and the 10kW Inverter Processes the Interconnection Study Deposit is equal to $50,000 plus $1,000 per MW up to a maximum of $250,000. The calculated amount is to be rounded up to the nearest $1,000. The completed application is the second of the three items that the IR must include in its package in order to have a complete IR. With the exception of the 10 kW Inverter Process, the completed application will be in the form of GIDAP Appendix 1 pursuant to ISO Tariff Section 25.1, including requested deliverability status, study process (e.g. Queue Cluster, Independent, Fast Track), preferred point of interconnection, voltage level, and all other required technical data. The ISO will forward a copy of the Appendix 1 Interconnection Request to the applicable Participating TO within five (5) Business Days of receipt. 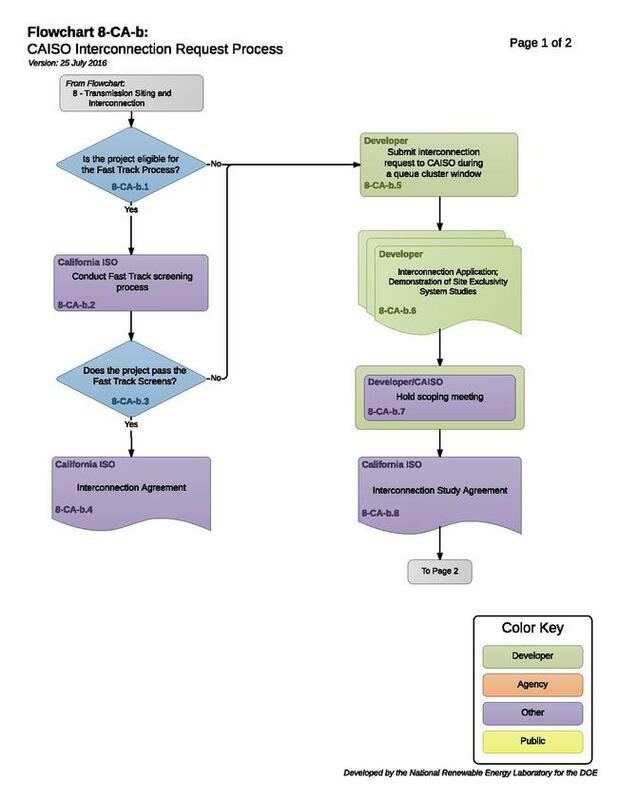 Generation Interconnection and Deliverability Allocation Procedures, Appendix 1. The site exclusivity requirement must be demonstrated as part of the IC's IR package, or, in lieu of such demonstration, tender a cash-equivalent site exclusivity deposit (in addition to, and separately from the Interconnection Study Deposit). Site exclusivity demonstration is the third of the three items that the IC must include in its package in order to have a complete IR. ICs who apply for the queue cluster study process but do not have site exclusivity at the time of the open queue cluster application window may make an additional in lieu of site exclusivity deposit (additional to their study deposit). The IC must also provide a site exclusivity deposit which the ISO holds in an interest bearing account at a bank or financial institution designated by the ISO for return when the IC has demonstrated site exclusivity. Generation Interconnection and Deliverability Allocation Procedures, section 3.5. If any of the above items are not provided during the cluster application window for a cluster study, the IR will be deemed incomplete and not accepted by the ISO and there will not be an opportunity to cure these deficiencies. The ISO will follow the business practice of returning an IR to the IC without an opportunity to cure under GIDAP 3.5.2.2. The argument that a “cure” is available would result in the IC’s ability to extend the window period by resorting to “self-help” by simply providing a package that the IC knows is inadequate upon submission. Therefore, it is highly encouraged that ICs submit their entire IR packages complete in all respects in a timely manner and not wait until the last day of the open window. GIDAP Best Management Practice, section 3.5. Within five (5) Business Days after the ISO notifies the IC of an IR that is complete, valid, and ready for study, the ISO must establish a date agreeable to the IC and the applicable TOs for the scoping meeting. All scoping meetings should occur no later than sixty (60) Calendar Days after the close of a cluster application window, unless otherwise mutually agreed upon by the parties. The ISO must endeavor to bring any affected system into the communications regarding the interconnection studies. The ISO will evaluate whether the IR is at or near the boundary of an affected TOs service territory or of any other affected system(s) so as to potentially affect such third parties, and, in such case, the ISO must invite the affected TOs, and/or affected system operator(s) in accordance with the GIDAP , to the scoping meeting by informing such third parties of the time and place of the scheduled scoping meeting as soon as practicable. GIDAP Best Management Practice, page 53. Before the interconnection study process begins, ICs are required to sign an interconnection study agreement wherein the IC agrees to pay for the reasonably incurred study costs. The timing and details of the interconnection study agreement are as follows: Within thirty (30) Calendar Days of the close of a cluster application window, the ISO provides each IC (who has a valid IR received during the cluster application window) a pro forma Generator Interconnection Study Process Agreement in the form set forth in GIDAP Appendix 3. Generation Interconnection and Deliverability Allocation Procedures, Appendix 3. The Phase I Interconnection Study must (i) evaluate the impact of all IRs received during the applicable cluster application window on the ISO controlled grid, (ii) preliminarily identify all network upgrades needed to address the impacts on the ISO controlled grid of the IRs, (iii) preliminarily identify for each IR required interconnection facilities, (iv) assess the point of interconnection selected by each IC and potential alternatives to evaluate potential efficiencies in overall transmission upgrades costs, (v) establish the maximum cost responsibility for network upgrades assigned to each IR in accordance with ISO tariff Appendix Y Section 6.5, and (vi) provide a good faith estimate of the cost of interconnection facilities for each IR. Generation Interconnection and Deliverability Allocation Procedures, section 6.2. Within thirty (30) Calendar Days of providing the Phase I Interconnection Study report to the IC, the applicable TOs, the ISO and the IC must hold a results meeting to discuss the results of the Phase I Interconnection Study, including assigned cost responsibility, modifications, change in commercial operation date, and other possible changes addressed in GIDAP BPM Section 6.7. GIDAP Best Management Practice, page 65. Within five (5) Business Days following the Phase I Interconnection Study results meeting, the IC must submit to the ISO the completed form that is part of the generator interconnection study process agreement for queue clusters. In this document, the IC provides critical information regarding the customer’s proposed generating facility for the purpose of scoping the Phase II Interconnection Study Work. The form is attached to GIDAP Appendix 3, the generator interconnection process agreement for queue clusters. The form is Appendix B to the agreement. Generation Interconnection and Deliverability Allocation Procedures, Appendix B. Through this completed form, the IC makes certain critical choices and/or affirmations about the nature of its proposed generating facility, so that the facility can be appropriately incorporated into the Phase II Interconnection Study effort. GIDAP Best Management Practice, page 71. The ISO, in coordination with the applicable TO, will conduct a Phase II Interconnection Study that will incorporate eligible IRs from the previous Phase I Interconnection Studies (or previous two Phase I Interconnection Studies for Clusters 1&2, and 3&4). If it is determined that the delivery network upgrades cannot be completed by the IC’s identified commercial operation date, provide that operating procedures necessary to allow the generating facility to interconnect as an energy-only resource, on an interim-only basis, will be developed and utilized until the delivery network upgrades for the generating facility are completed and placed into service. 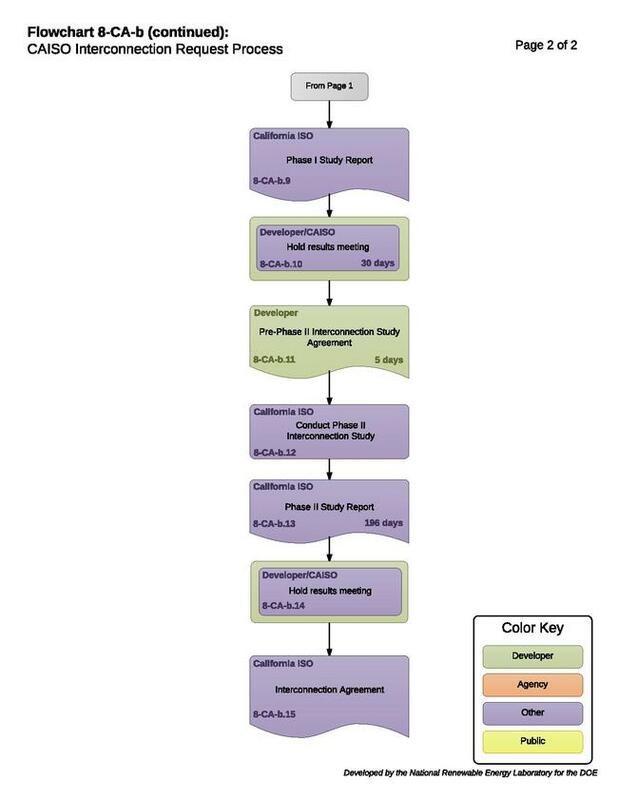 Generation Interconnection and Deliverability Allocation Procedures, section 8.
the IC demonstrates the general Phase II Interconnection Study timeline is not sufficient to accommodate the COD for the large generating facility. Generation Interconnection and Deliverability Allocation Procedures, section 8.5. Within thirty (30) Calendar Days of providing final Phase II study report to the IC, the TO, ISO, and the IC will participate in a Phase II Results Meeting meet to discuss the results, including selection of the final commercial operation date. Note the ISO’s current practice is to incorporate the time frame for completion of the transmission build out when determining the COD. Generation Interconnection and Deliverability Allocation Procedures, section 8.7. No more than ninety (90) Calendar Days after ISO provides a final Phase II Interconnection Study report or a facility study report (or system impact study report if the facilities study is waived) for negotiation of the Generator Interconnection Agreement (GIA), unless otherwise agreed by the parties. If the IC executes the final GIA, the applicable TO(s), ISO and the IC must perform their respective obligations in accordance with the terms of the GIA, subject to modification by Federal Energy Regulatory Commission. Generation Interconnection and Deliverability Allocation Procedures, section 13. This page was last modified on 9 February 2017, at 16:51.